aPercentages of the average annual yield from all Antarctic fisheries from 199097 (221,174 tons per year) based on data from the United Nations Food and Agriculture Organization (http://www.fao.org). See Chapter 10: Ecosystem Conservation. bNumber of Antarctic tourists from different nations in 1999-2000 excluding 1161 tourists from among the total 14,762 tourists from 70 nations (not shown). Number of passengers supported by principal operators from different nations in 1999-2000 (total 14,386) excluding 376 passengers who were supported by miscellaneous operators. Data from the International Association of Antarctic Tour Operators (http://www .iaato.org). children being born as evidence of their ''effective occupation'' for asserting sovereignty (Chapter 3: Terra Australis Incognita). Among the tourist flights to Antarctica, most land in the continental interior to launch adventure expeditions. There also are overflights of Antarctica that depart from Australia. However, the overall scope of Antarctic tourist flights has been diminished since 28 November 1979—when all 257 passengers on an Air New Zealand DC10 (Flight 901) crashed into Mt. 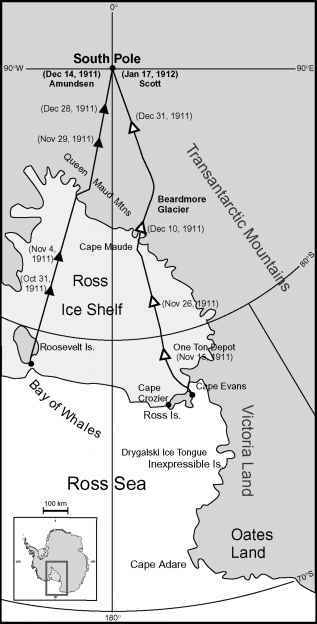 Erebus, Ross Island, and were killed. FIGURE 11.4 Map of the Antarctic Peninsula region showing the sites of year-round Antarctic research stations (stars) in 1998 (http://www.usarc.usgs.gov): 1, Comandante Ferraz, Brazil; 2, Arctowski, Poland; 3, Jubany, Argentina; 4, Bellingshausen, Russia; 5, Marsh/Frei, Chile; 6, Great Wall, China; 7, Artigas, Uruguay; 8, King Sejong, South Korea; 9, Escudero, Chile; 10, Arturo Prat, Chile; 11, Bernardo O'Higgins, Chile; 12, Esperanza, Argentina; 13, Marambio, Argentina; 14, Palmer, United States; 15, Faraday/Vernadsky, United Kingdom/Ukraine; 16, Rothera, United Kingdom, and 17, San Martin, Argentina. Stations 1 through 9 are on King George Island alone. Sites of tourist ship visits (circles) since 1989 also are shown (http://www.iiato.org). In deep sorrow, the Antarctic Treaty nations adopted Recommendation XI-3 (Air Disaster on Mt. Erebus) in 1981 to establish among all governments that ''the site on the northern slopes of Mount Erebus where the accident took place be declared a tomb and that they ensure that the area is left in peace.'' The tragedy on Mt. Erebus represents the larger challenge of anticipating consequences and developing effective guidelines for tourist and nongovernmental expeditions, which are rapidly increasing in the Antarctic region (Fig. 11.3). As an example of proactive policies, the Antarctic Treaty nations did adopt measures prior to the Mt. Erebus accident because of the inherent hazards of overflying Antarctica and the fact that ''tourist overflight capacity exceeds existing capabilities of air traffic control'' (Recommendation X-8). How can we avoid accidents and minimize the consequences when they happen? Among the actual and potential resources, however, minerals alone electrified the focus of humankind on Antarctica. The economics of mineral exploitation in Antarctica had been considered since before the International Geophysical Year (IGY), as noted in 1958 by the Director of the United States IGY Antarctic Program, Laurence Gould: ''The structure and geology of the rocks in west Antarctic suggest the possibility of oil. Traces of manganese, nickel, copper and other ores have been found. . . .'' In fact, past connections with the other Gondwana continents (Fig. 6.3)—which do have mineral reserves that are being exploited (Fig. 11.5)—suggests that there are regions of Antarctica that also may contain mineral deposits. FIGURE 11.5 Reconstruction of the Gondwana supercontinent, showing the known metal deposits (see key) and major oil fields (open circles) among the Southern Hemisphere continents that were connected with Antarctica around 180 million years ago (Fig. 6.3). In addition, the relative locations of the Bushveld Complex in South Africa and the Dufek Complex in Antarctica are shown. Modified from Cook (1990). For example, the Bushveld Complex in South Africa and the Dufek Complex in Western Antarctica share iron-rich magnetite characteristically associated with platinum-group metals. 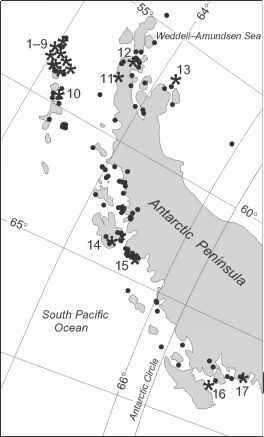 Similarly, gold deposits in southern Chile and traces of gold in the Antarctica Peninsula have been identified. In addition, traces of bismuth, chromium, cobalt, copper, lead, lithium, manganese, molybdenum, nickel, silver, tin, uranium, and zinc have been found in various areas around Antarctica (Fig. 11.5). 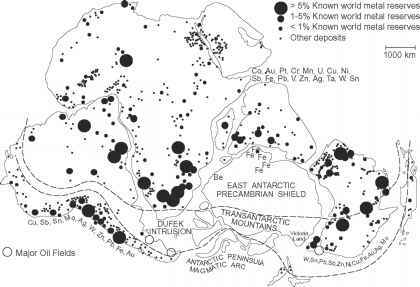 There also are nonmetallic minerals—particularly coal, which has been identified in exposed mountain seams areas around Antarctica (Fig. 3.1, top). These sedimentary deposits containing Glossopteris and other terrestrial plant fossils from 250 million years ago are similar to rocks in the Beacon Supergroup extending across other Gondwana continents (Fig. 3.1, top). It has been speculated that Antarctic coal deposits may exceed several hundred billion metric tons, although of low quality with high ash, sulfur, and tar characteristics. However, it was only after the Glomar Challenger began drilling in the Ross Sea in 1972 that Antarctic mineral resources became a charged topic (Fig. 6.4). During this leg of the Deep Sea Drilling Program (now the Ocean Drilling Program), elevated gas ratios of ethane to methane were found in offshore sediments—indicators of potential petroleum. Coincidentally, the following year, the Organization of Petroleum Exporting Countries embargoed oil to Western Hemisphere nations and poignantly introduced the world to the fact that global hydrocarbon reserves are finite. Gasoline prices skyrocketed and consumers across nations waited in long lines for their rations of automobile energy. Later in 1973, the United States Geological Survey noted in an internal circular that the Glomar Challenger data indicated that continental shelf regions adjacent to the Ross Ice Shelf and Filchner-Ronne Ice Shelf (Fig. 8.6) may have oil reserves on the order of 45 billion barrels. As a result of this government estimate, the Wall Street Journal heralded that ''45 billion barrels of oil and 115 trillion cubic feet of natural gas could be recovered from the continental shelf of West Antarctica.'' For comparison, in 1982 the United States Department of Energy determined that proven reserves of oil in the hugely productive British sector of the North Sea were around 40 billion barrels. Despite the large gap in knowledge between known economic reserves and wishful thinking (Table 11.2), information from these projects, reports, and data interpretations was sufficient to generate worldwide interest in Antarctic mineral resources.